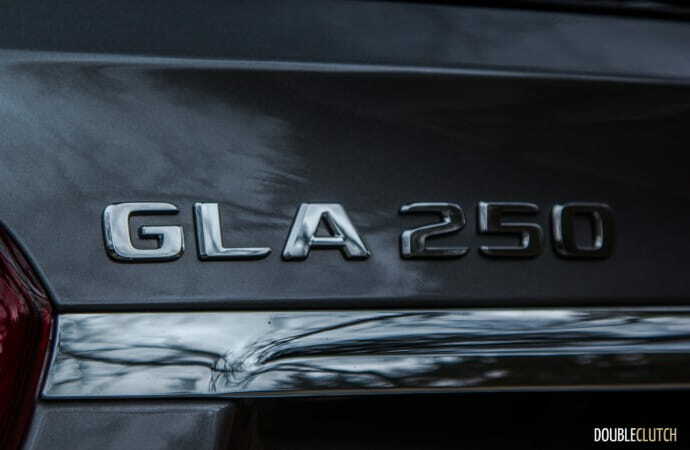 Volume sellers like the GLA 250 make the automaker additional money that can then be invested into passion projects. 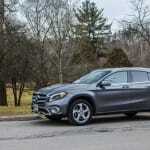 The Mercedes-Benz brand began to offer the subcompact siblings in 2013, as model year 2014 vehicles. 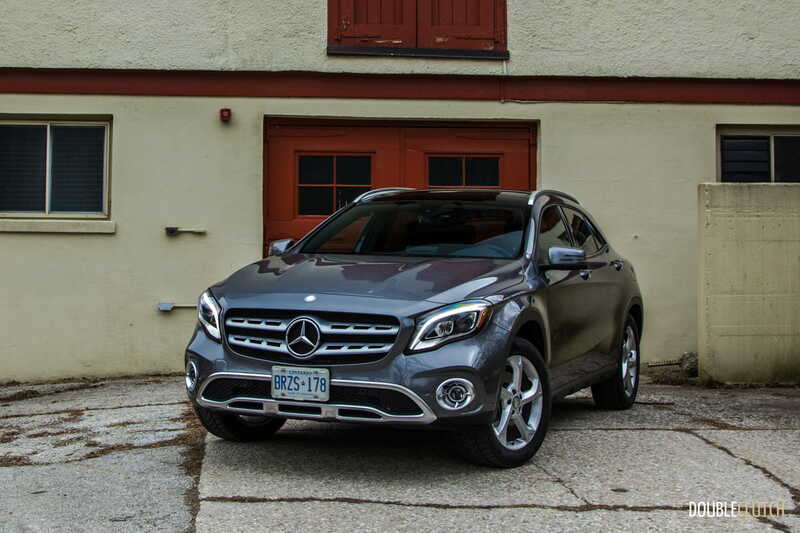 The CLA and its slightly taller sibling, the GLA-Class, have sold like hotcakes to Canadians over the past four years. 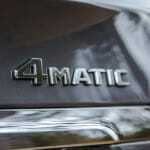 This year marks a mid-cycle refresh for the two, in order to bring them up to par with newer entries in the segment. 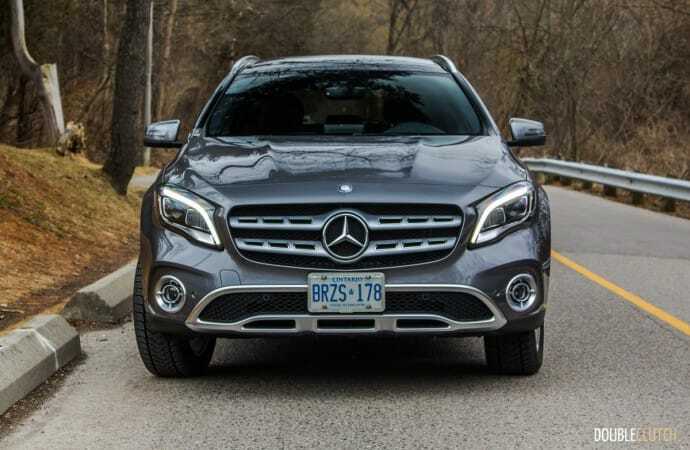 This 2018 Mercedes-Benz GLA 250 4MATIC is a frequently chosen model by Canadians, and in my personal experience, two or three GLAs are seen on the roads for every BMW X1 (reviewed here) or Audi Q3. 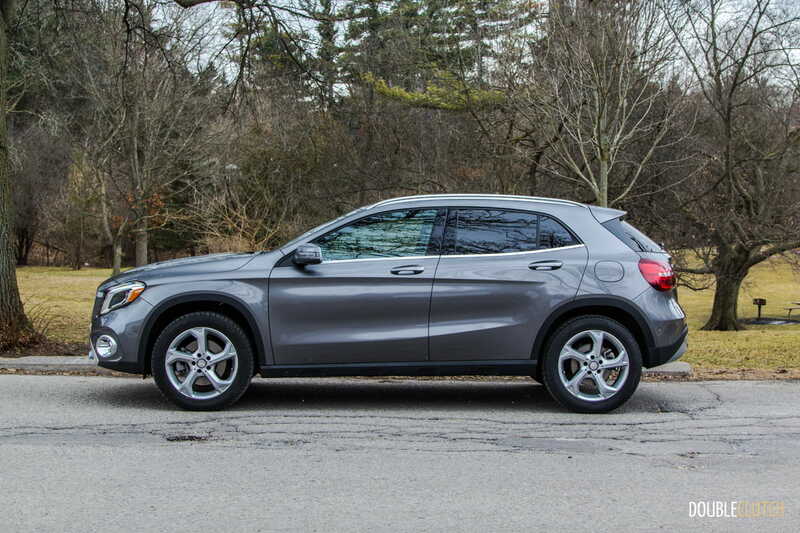 Perhaps the subcompact crossover isn’t a class of vehicle that particularly excites enthusiasts, and there are plenty of luxury brand elitists that would accuse Mercedes-Benz of diluting the brand with models like these. 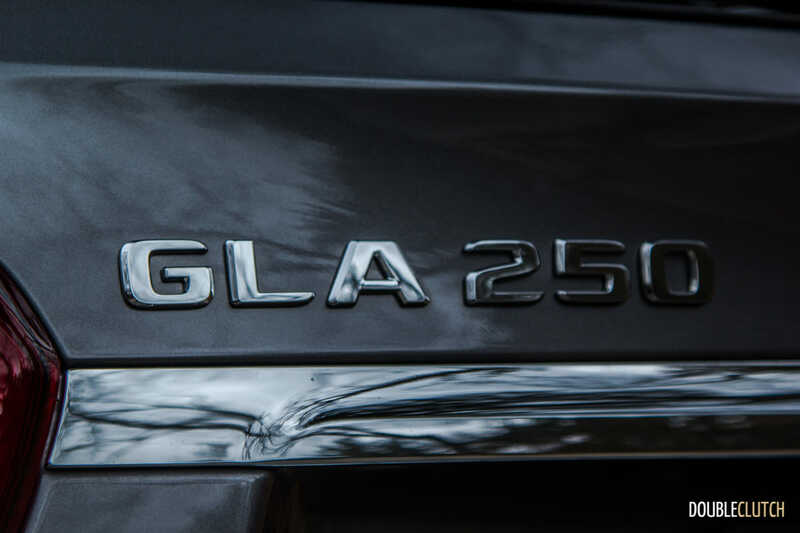 The reality is though that volume sellers like the GLA 250 make the automaker additional money that can then be invested into passion projects with niche markets, like the AMG brand. Competing with the likes of the X1 and Q3, the GLA’s main advantage is that it really is a glorified hatchback, and this isn’t a bad thing for the most part. 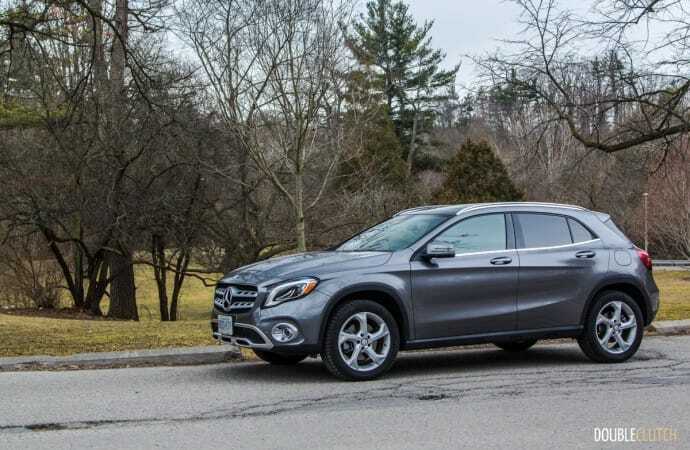 The ride height has been increased when compared to the CLA 250 (reviewed here) it shares its platform with, but the GLA is not all that much taller. 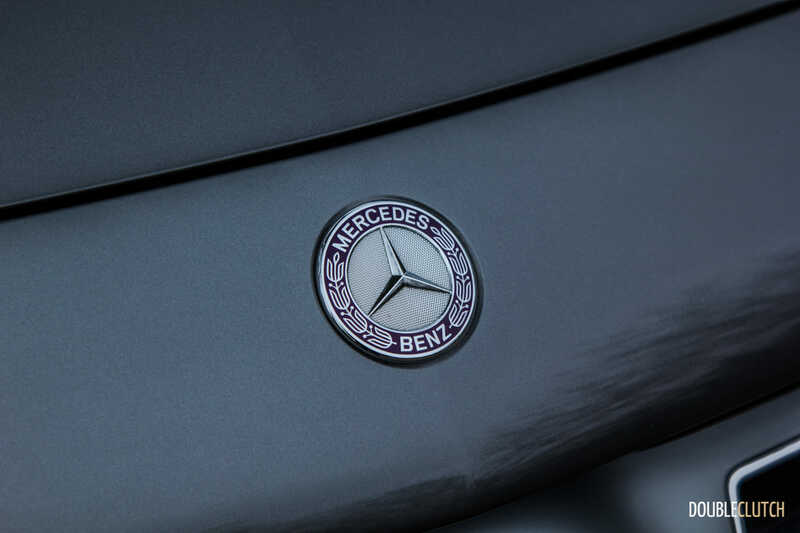 It does deliver the higher driving position that today’s buyers demand, but being lower, offers a more aerodynamic profile that helps with efficiency and drag. 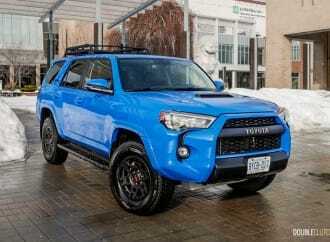 The 2018 model gets a redesigned fascia, and receives optional LED headlights, as equipped on our test vehicle. 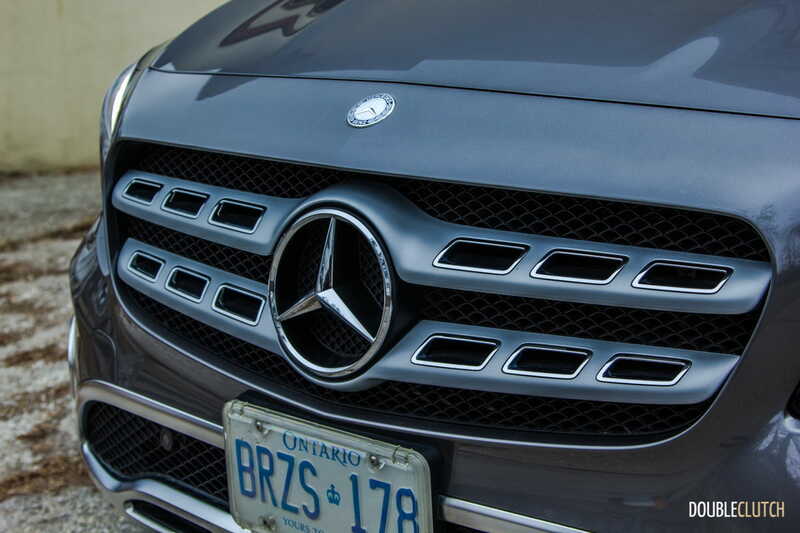 The grille is new and is reminiscent of the larger GLS-Class, and a fresher bumper makes space for new fog lights as well. 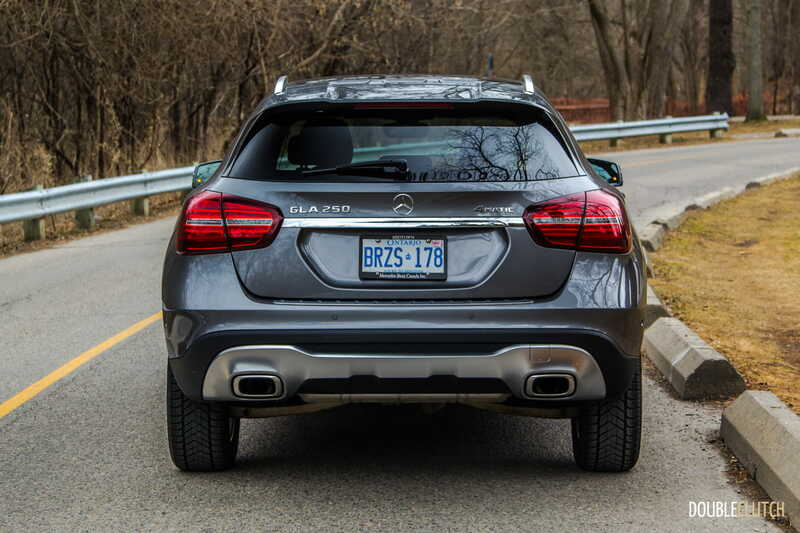 The taillights are also updated, now of the LED variety as well with a “smoked” look that suits the GLA’s overall style. 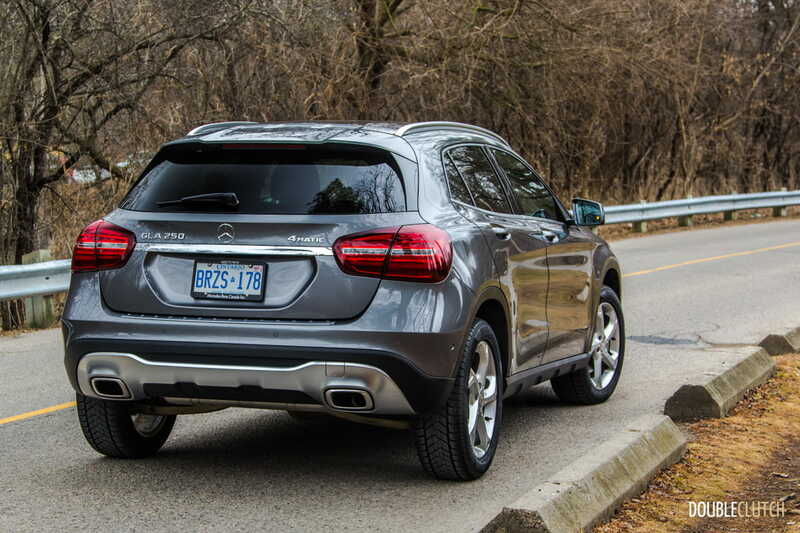 The biggest difference between the GLA and its rivals is evident when you stand beside it; it’s significantly shorter in height, giving it a sportier stance that I personally find very appealing. 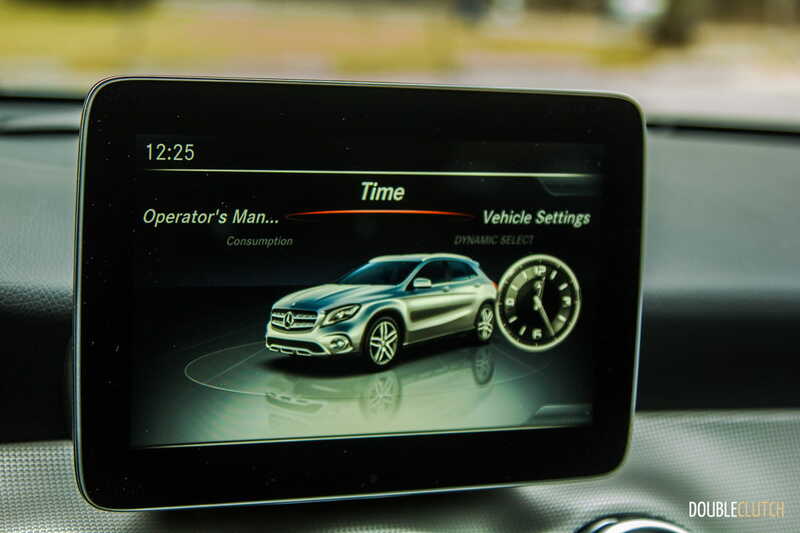 Moving onto the interior, the new GLA’s most significant feature is the updated infotainment system. 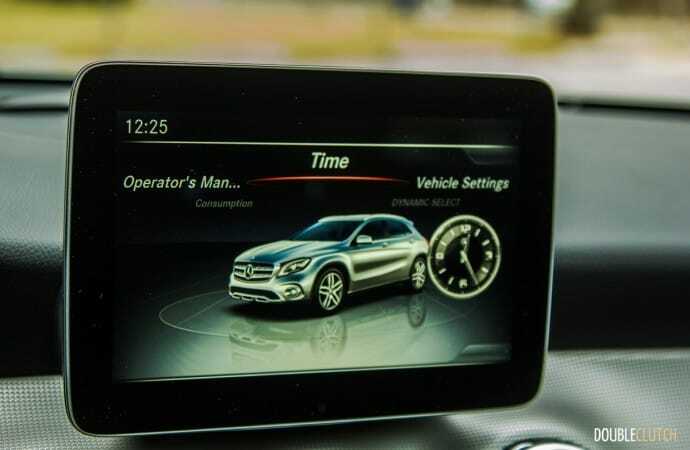 Now centered around an 8.0” screen (the last model had a 7.0” screen) that features connectivity like Apple CarPlay and Android Auto, the system is easy to use and doesn’t feel low-rent anymore. 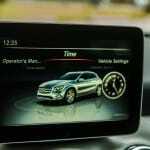 Now all of the major German players are offering CarPlay, but Android Auto isn’t catching on quite as quickly. 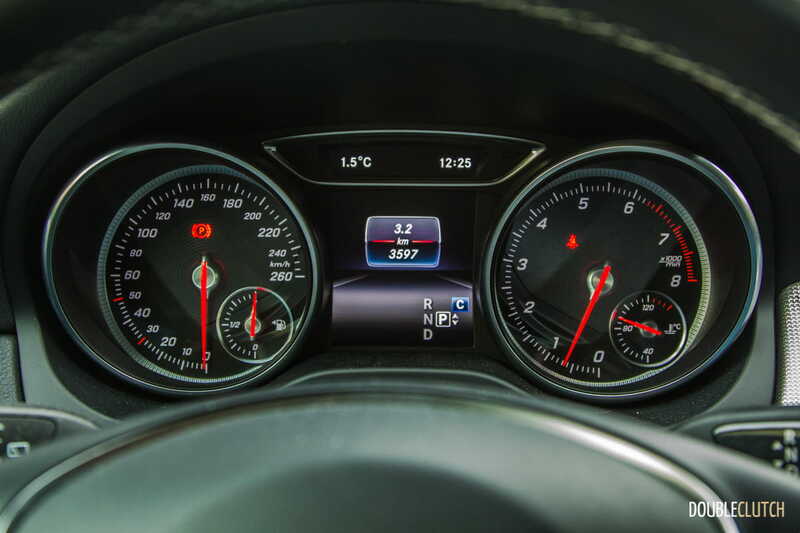 Directly in front of the driver, the instrument cluster now has a black-faced speedometer and tachometer, which are both easier to read and more pleasing to the eye. 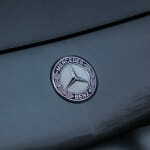 The rest of the cabin is pretty standard fare, though not nearly as luxurious as Mercedes-Benz’s more premium products. 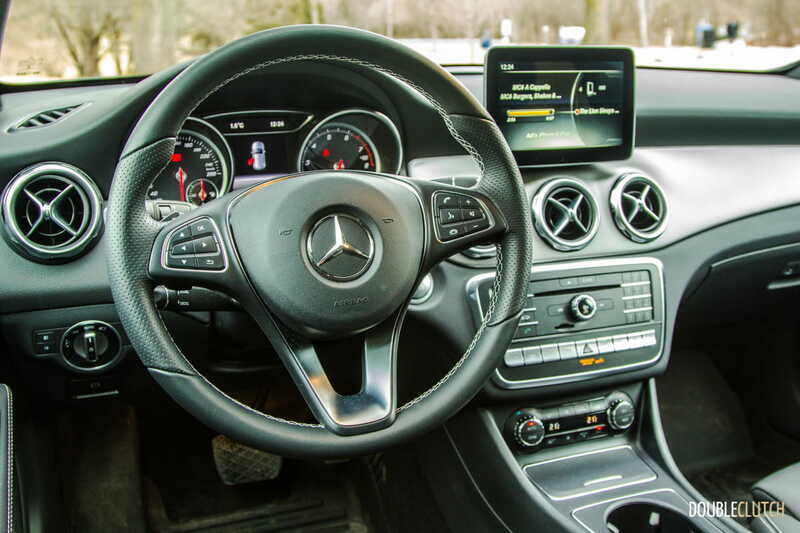 The current E-Class (reviewed here) really is a benchmark within its segment, with beautiful open pore woods and aesthetics all around. 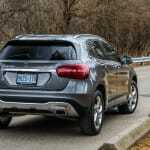 The GLA offers a fairly comfortable driving position with decent seats that offer some support, though there are some touches that make it evident that this is one of the more inexpensive offerings in the lineup. 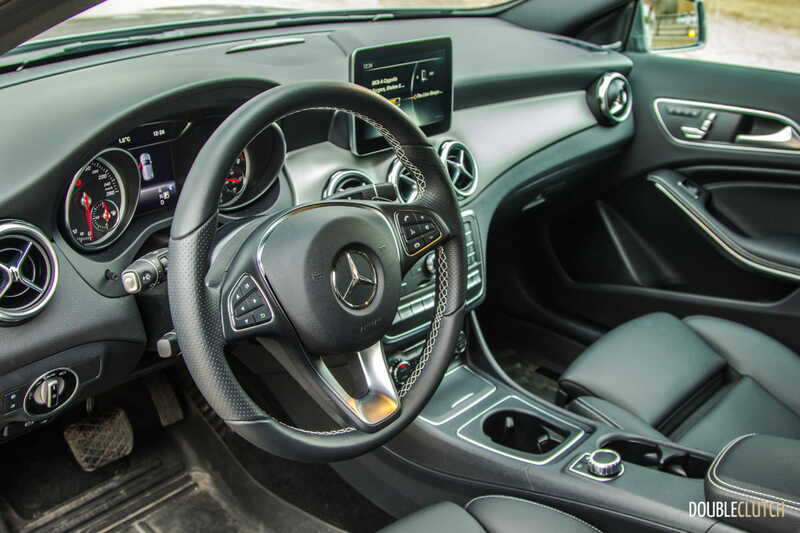 For instance, the Mercedes-Benz power seat controls located on the front doors are in play, but the headrests are manually adjusted rather than powered. 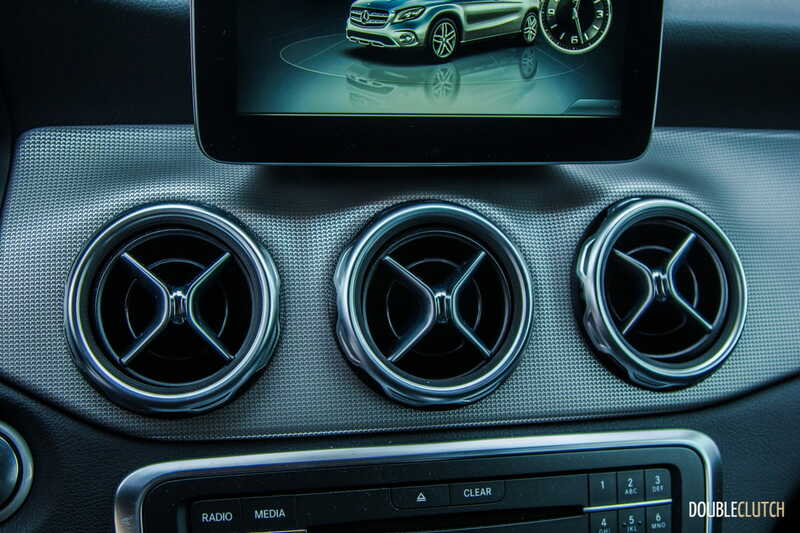 The infotainment knob is a smaller knob with two buttons rather than the larger one combined with a touchpad as seen in the C-Class (reviewed here). 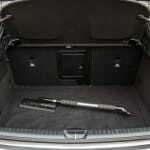 Couples or those with small children will have no issues with legroom, though the rear passenger area is rather tight. 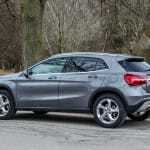 It’s still right in line with the subcompact crossover segment, and more usable space than mainstream offerings such as the Mazda CX-3 (reviewed here). 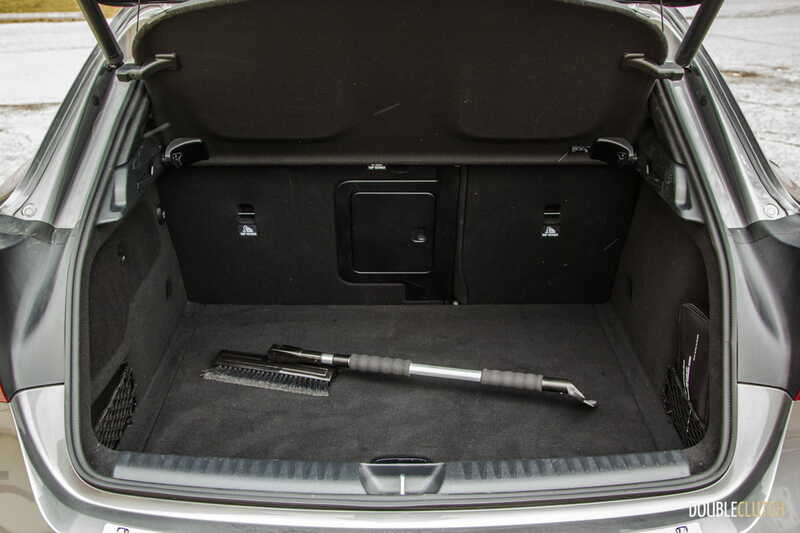 Headroom is compromised thanks to the panoramic sunroof, which to our surprise, only tilts upwards a little bit rather than fully sliding open. Regardless, with the shade retracted, the glass roof brings some welcomed light into the cabin, giving it a nice overall feel. 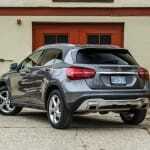 The GLA 250 offers a 2.0L turbocharged inline four-cylinder engine. 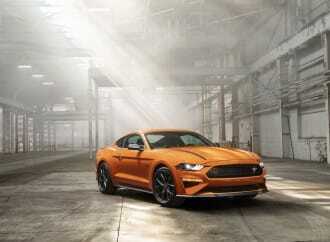 Output is 208 horsepower at 5,500RPM and 258 lb-ft. of torque at just 1,250RPM, with the only available transmission being a seven-speed dual-clutch. It may not have all that much horsepower, but the torque is very evident at city speeds, and the 2.0L has no problem darting the little GLA around the urban core. 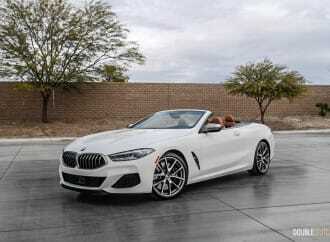 The dual-clutch isn’t the best off the line, with some noticeable lag, but when the Dynamic Select is set to “Sport” mode, the shifts are quick and predictable. 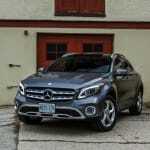 A more powerful Mercedes-AMG GLA 45 is available for those who want close to 400 horsepower in their lives. 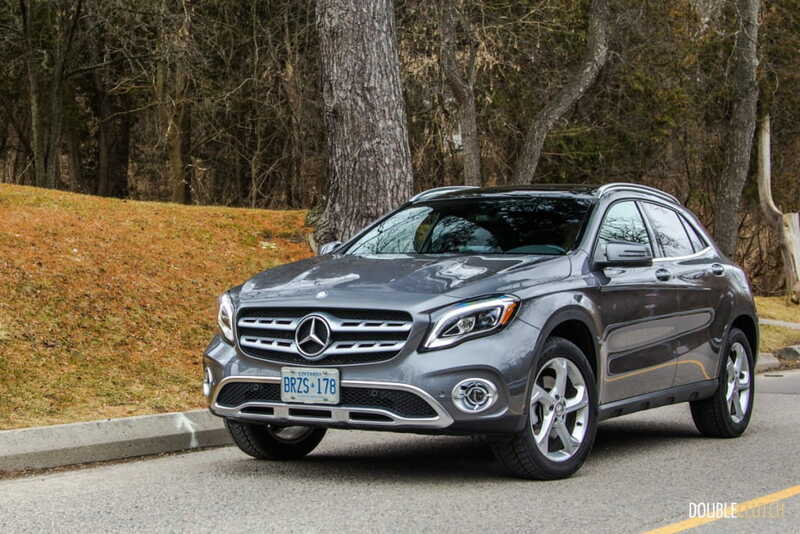 Though it has its limitations in the power department, the GLA 250 4MATIC handles surprisingly well. 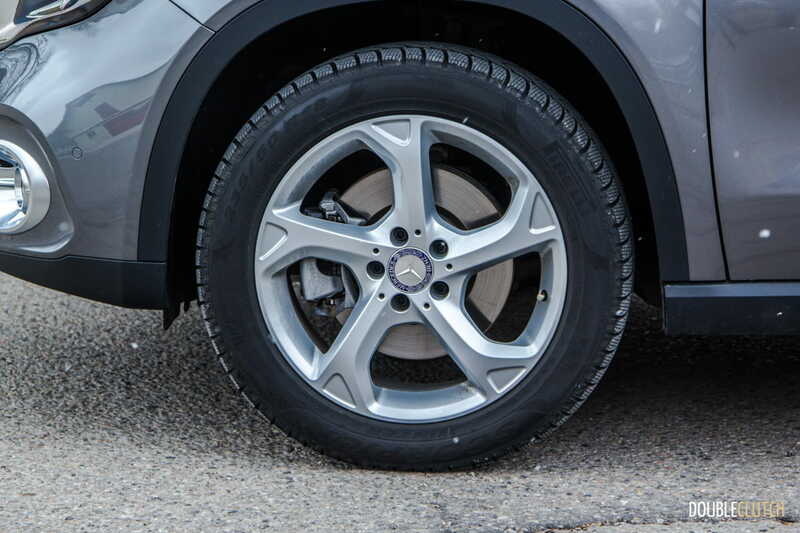 It’s quite precise and sharp when going around corners, even on the winter tires like our test vehicle was equipped with. 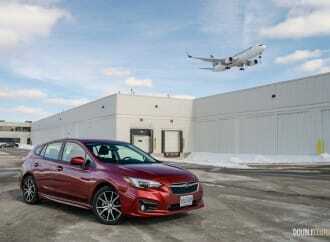 Steering action is light and quick, and body roll is minimal thanks to the low ride height and firm (but not adjustable) suspension. 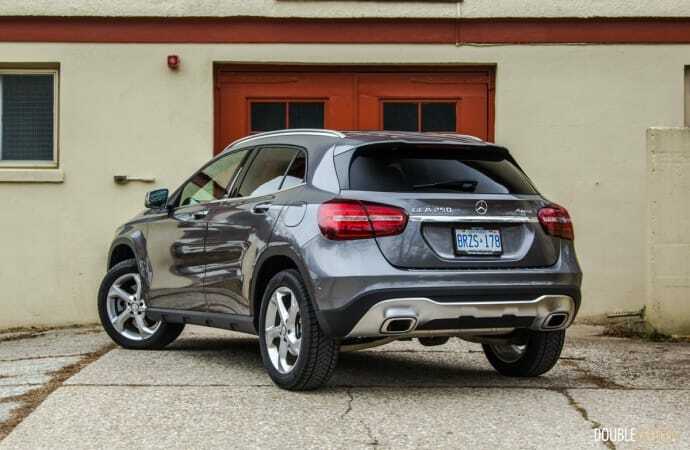 Ride quality on previous GLA models was always a complaint, but there seem to be some invisible suspension geometry updates that have helped in this regard. 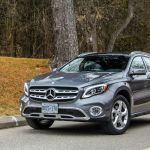 It’s still a very firm little crossover, and its competitors with more suspension travel and ride height travel are a bit softer. 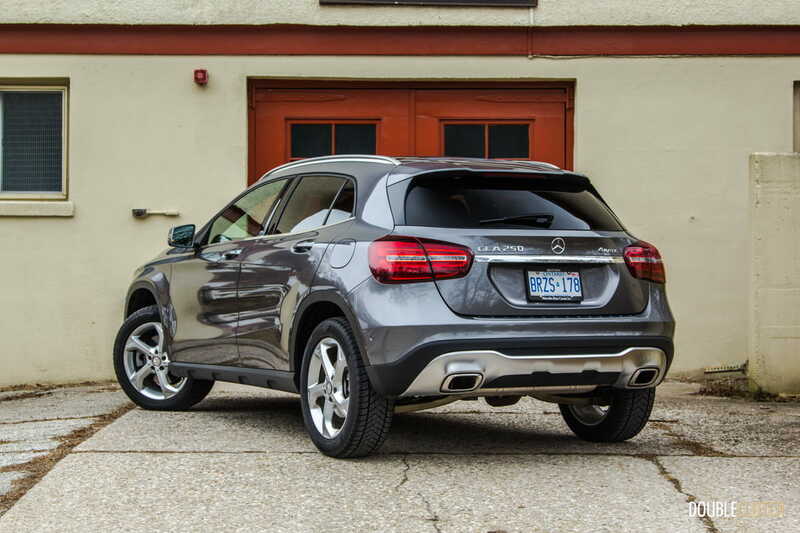 The GLA feels almost athletic in comparison around corners, though ride around the city still is on the firmer side. 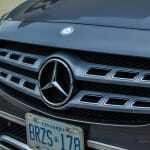 Buyers can get around this slightly by opting for a smaller wheel/tire package, as larger AMG-spec wheels can be a bit jarring in pothole-ridden Toronto. 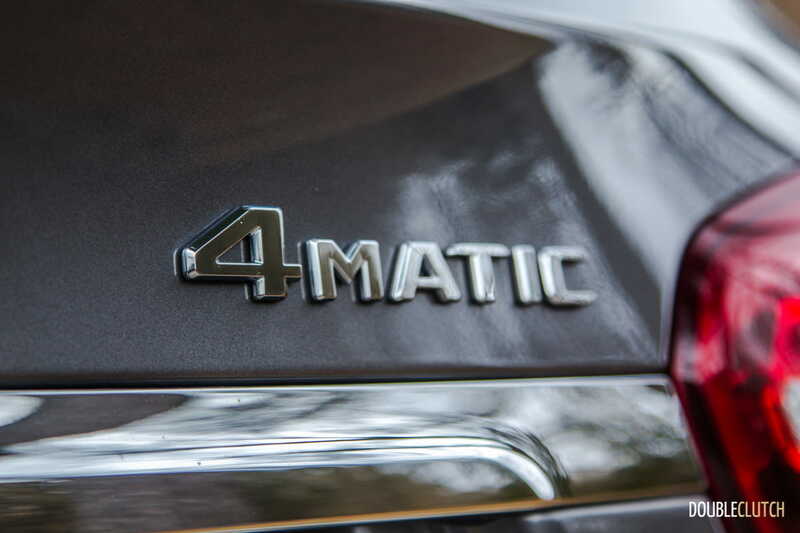 Within the Dynamic Select drive mode selector, there is a new “Off-Road” mode, which adapts the systems to be optimal for escaping the concrete jungle. 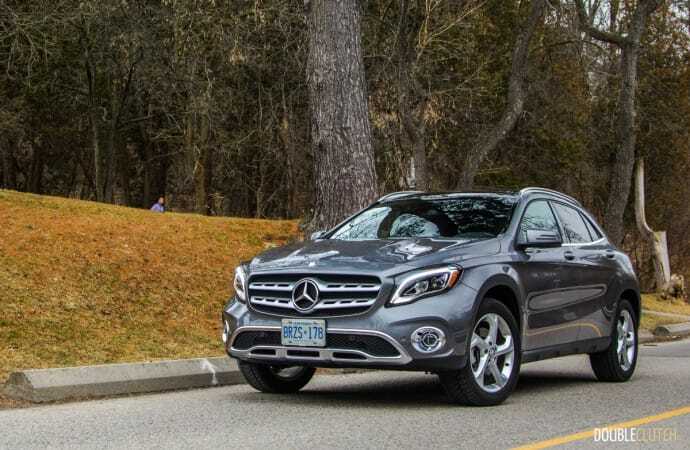 Naturally, the GLA 250 won’t be used to cross any serious trails, but the 4MATIC system can use the brakes to mediate power and maintain traction. 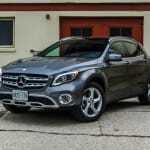 There is also a new “DSR” system, short for Downhill Speed Regulation. 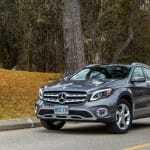 Essentially, it’s a hill descent system that maintains a slow speed when going down grades. 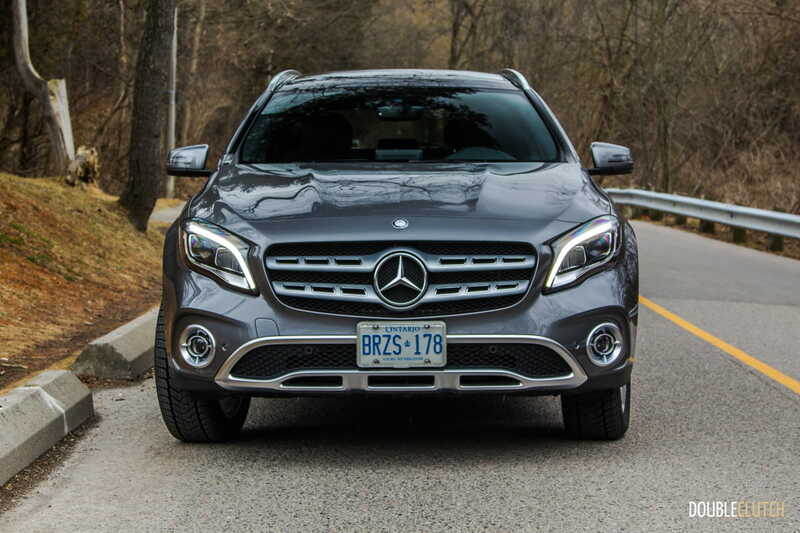 Consumption for the 2018 GLA 250 is rated at 10.1L/100km in the city and 7.6L/100km on the highway, with an average of 9.0L/100km. 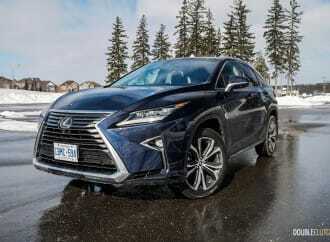 A week’s worth of testing over 500km returned an average of exactly 9.1L/100km, which is right within the suggested ratings. 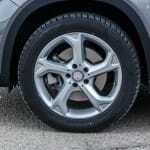 We observed as little as 7.7L/100km on the highway, operating in freezing temperatures on winter tires. The GLA commands premium 91-octane fuel, which is what our test took place on. 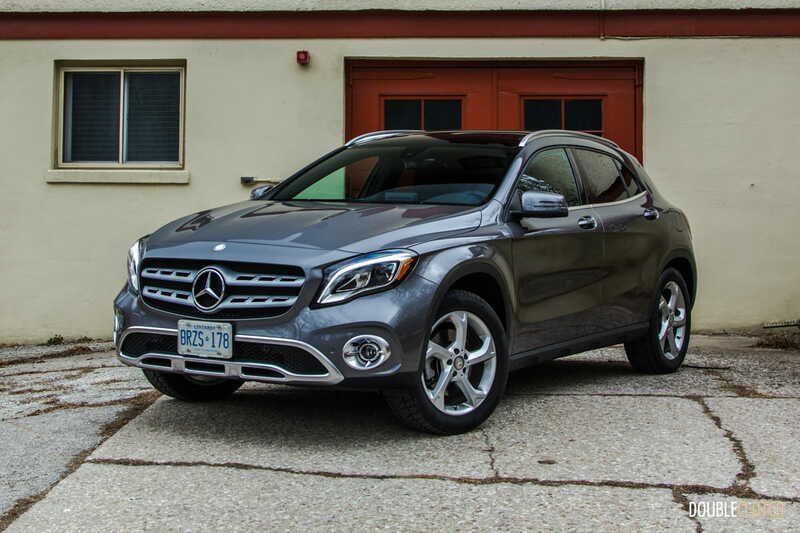 Mercedes-Benz Canada prices the GLA 250 from $38,500 in base trim. Our test vehicle was fully loaded, with a $2,200 Premium Package, $2,000 Premium Plus Package, $1,480 Panoramic Sunroof, $1,000 Harman/Kardon sound system, and an additional $900 for Parktronic Park Assist. 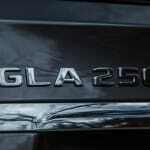 The total sticker was $46,970. 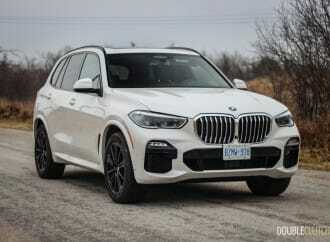 This seems expensive, but from our experience it’s very easy to equip a BMW X1 into the $50,000 range, along with the Audi Q3 and slightly larger Lexus NX. 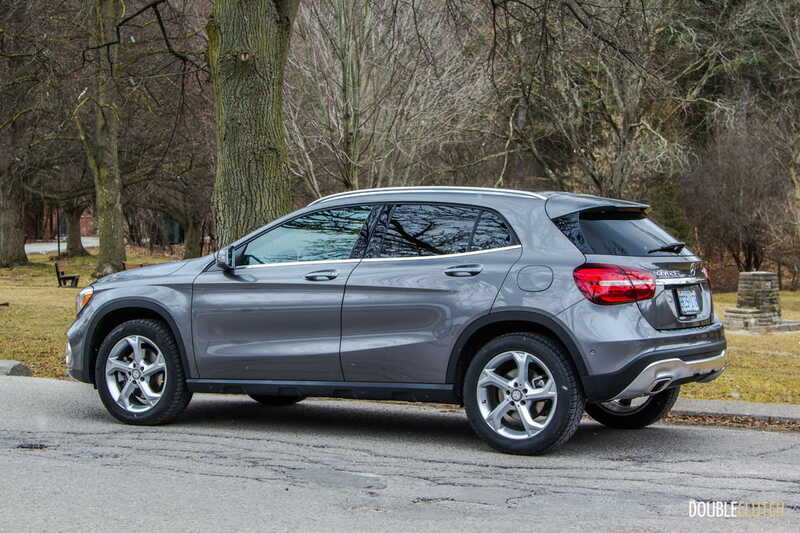 The subcompact crossover craze is here to stay, with new entries seemingly being debuted at every major auto show globally. 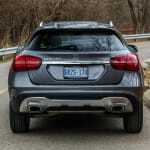 Virtually everybody has a player in this segment now, including Infiniti with their GLA-based QX30 (reviewed here). 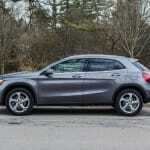 The 2018 Mercedes-Benz GLA 250 4MATIC is a little bit smaller than many players, but where it really does excel is in its sharp driving dynamics. 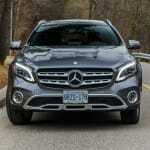 Those who prioritize handling and (subjectively) good looks will want to take a serious look at this latest example.